The So Very Grateful stamp set from the Stampin' Up! 2014 Occasions Catalog is an outline stamp set that just begs to be colored. And it's gorgeous! (See another example here.) But I wanted to try something less fussy with this set, so I decided to do a monochromatic card. After it was finished, I felt like it needed something else, so I added an "invisible spotlight". I stamped the image in the same color and punched it out (in this case, I used the Butterfly Punch) and then popped it up over the stamped image in the same place. The result is a subtle emphasis that almost seems "invisible". Here is the inside of the card. I ended up using every single stamp from this stamp set! Labels: #stampinup, cards, Clean and Simple, Framelits, monochromatic, Occasions Catalog, punches, Stampin' Up! It's Tuesday! Which means it's time for new weekly deals! 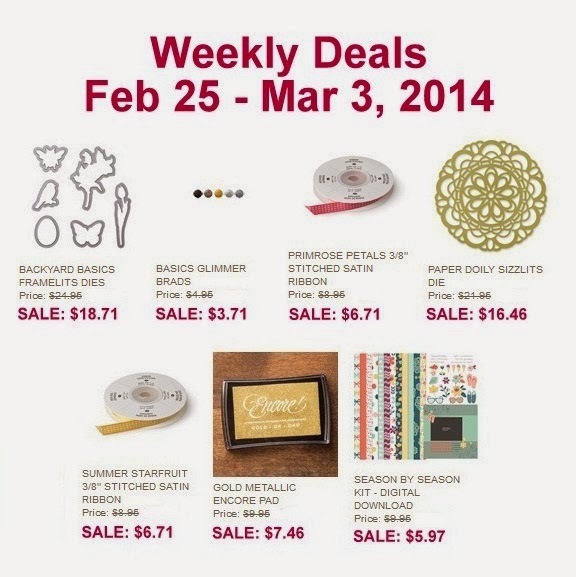 I hope you find something in this week's sale that fills a need in your paper-crafting collection! Check out this new card kit from Stampin' Up! I love it because it includes absolutely everything that you need to make 20 cards -- including the stamps, ink, clear block, and adhesive! Ok, maybe you'll need one thing -- scissors. But everything else is in the kit. And the price is incredible -- just $19.95!! Of course the best part of paper-crafting is doing it with friends! So I've scheduled a Hip Hip Hooray Card Class! We'll be making the cards TOGETHER! The class fee is $25, which covers the tax and shipping on the card kit. Click HERE to register for the class, to be held on Saturday, March 15 at 9 am in Urbana, Illinois. Live too far away or can't attend? 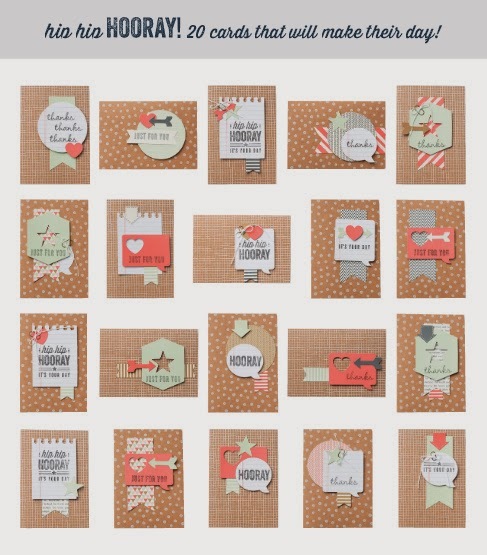 Buy the Hip Hip Hooray Card Kit in my Online Store and enjoy this "class" in your jammies at home! 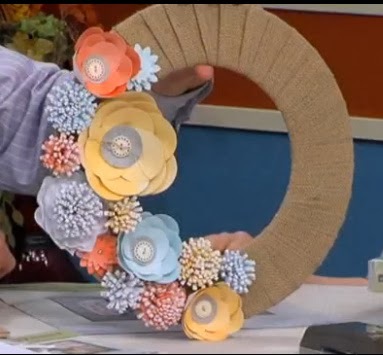 I bought the Springtime Hello Garland kit from the Occasions Catalog with the idea that I would make something OTHER than a garland and that's exactly what I did! 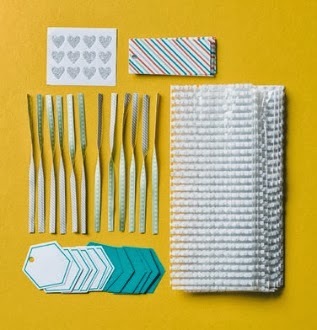 The garland kit includes sticky die-cuts that are scored and meant to be folded in half over the garland twine. I cut them apart and put them on notecards instead. I added some punch outs from the new Petite Petals punch and a little Jumbo Rhinestone bling to make it sparkly. A quick warning: The Petite Petals Punch is currently out of stock and on backorder. It was more popular than Stampin' Up! expected. The Twisty Treats Kit (#133153) is one of the Sale-a-bration gifts that you can choose for FREE when you order $50 or more during Sale-a-bration (which ends March 31). Click here to see my Sale-a-bration Quick Gift Guide to see what other gifts you can choose from. I guess I am a little late in posting this card because it's kind of a valentine, but really, we can (and should!) express our love and gratitude for family and friends all year long! I have a bunch of die-cut Pretty Presents Designer Tags leftover from the Holiday Catalog, but you can certainly create a similar tag with the new Tag Topper Punches and some designer paper. The sentiment (XOXO) is from the "Oh Goodie!" stamp set that was in the Holiday Catalog and is STILL available on the Holiday Carryover List. If you're looking for holiday themed stamp sets, punches, and framelits, make sure to check out the Stampin' Up! Holiday Carryover List. Click here to view available products now. You can enter the item number in my Online Store and add any of these items to your next order! I CASEd this card from my friend Robin Armbrecht who designed the make and takes for our last team meeting. I changed the colors in attempt to make it more masculine, but honestly, the heart on the cupcake makes it a little girly, so I went ahead and added the rhinestone and glitter! Click here to see more cards using the Another Great Year stamp set. I like how Robin stamped the banners on another color and then cut them out and adhered them over the stamped image on white cardstock. This technique is called paper piecing.